Use these writing tips to craft a solid resume for a product manager. This is what your product manager resume should look like. Project managers don't have a single industry in which they're hired, which is good news for you as a job seeker. Various industries rely on project managers to seamlessly reach their goals. To be a successful candidate for product manager jobs, resume expert Kim Isaacs says it helps to have a comprehensive resume. 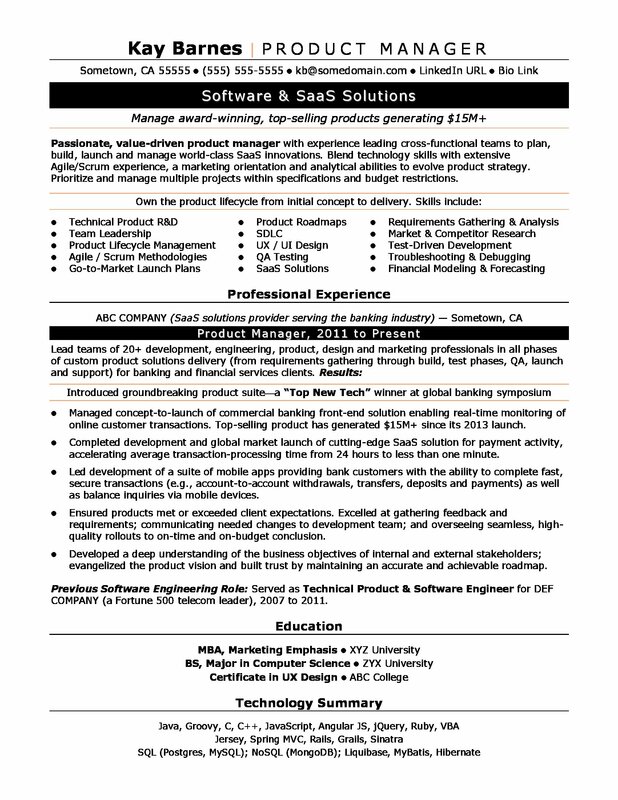 For writing tips, view this sample resume for a product manager that Isaacs created below, or download the product manager resume template. The Bureau of Labor Statistics (BLS) doesn't collect data on project managers, but classifies these workers among business operations specialists. As such, you'll find the highest level of employment for project managers in the following states: California, Texas, Florida, Illinois, and New Jersey; and in the following metropolitan areas: Washington D.C., Los Angeles, Chicago, New York City, and Denver. As a project manager, you can expect to earn a median wage of $70,010 per year, according to the BLS. Additionally, you can search for product manager jobs on Monster. Passionate, value-driven product manager with experience leading cross-functional teams to plan, build, launch and manage world-class SaaS innovations. Blend technology skills with extensive Agile/Scrum experience, a marketing orientation and analytical abilities to evolve product strategy. Prioritize and manage multiple projects within specifications and budget restrictions. Managed concept-to-launch of commercial banking front-end solution enabling real-time monitoring of online customer transactions. Top-selling product has generated $15M+ since its 2013 launch. Completed development and global market launch of cutting-edge SaaS solution for payment activity, accelerating average transaction-processing time from 24 hours to less than one minute. Led development of a suite of mobile apps providing bank customers with the ability to complete fast, secure transactions (e.g., account-to-account withdrawals, transfers, deposits and payments) as well as balance inquiries via mobile devices. Ensured products met or exceeded client expectations. Excelled at gathering feedback and requirements; communicating needed changes to development team; and overseeing seamless, high-quality rollouts to on-time and on-budget conclusion. Developed a deep understanding of the business objectives of internal and external stakeholders; evangelized the product vision and built trust by maintaining an accurate and achievable roadmap. Previous Software Engineering Role: Served as Technical Product & Software Engineer for DEF COMPANY (a Fortune 500 telecom leader), 2007 to 2011. Seeing a product from inception to completion is a lot like a job search. Step one is fine-tuning your resume. Could you use some help with that? Get a free resume evaluation today from the experts at Monster's Resume Writing Service. You'll get detailed feedback in two business days, including a review of your resume's appearance and content, and a prediction of a recruiter's first impression. It's a quick and easy way to make sure your resume is doing what you need it to do—that is, highlight your skills and the value you'd bring to a company so that hiring managers take notice.